I know you think it’s silly that I am writing to you, truth be told, it is. 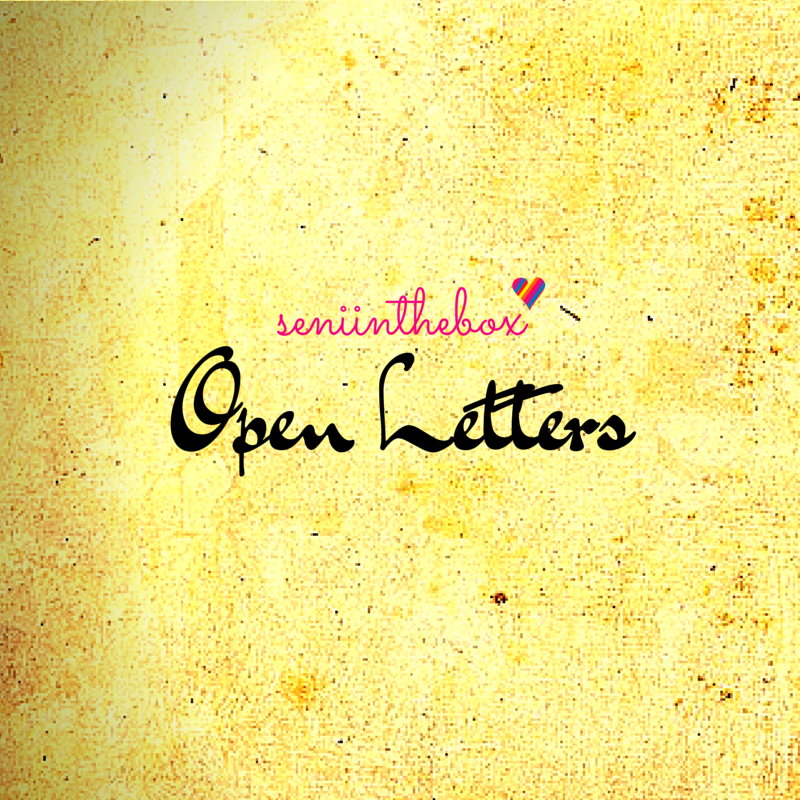 I haven’t written letters in a long time, let alone one that wouldn’t be open by the intended recipient. But I think it’s probably wise you know on why I have decided on taking the decisions I did. Again, it’s highly unlikely that you’ll read it but I need to get it off me, so here we are. It might sound ironic, but I love children. Especially little ones. I like to think it’s my mental age, but I get along with them, probably because I am jealous of them being able to simply eat, poop and nap whenever they want. It’s the simple life I’m a little jelly of. But besides that, we get along. There are building blocks, Barbie dolls and unintelligible noises. How wonderful. But no, I don’t want any of my own. Yes, you are right my love, I am being selfish. But I have a good reason for being selfish and I want you to hear me out. I am scared for you. I am going to be that helicopter parent even after you are married and leave me because I will be always protective of you. We might always argue because while I would make sure you are independent and go by bus and do your own thing, I might also follow you from a distance. Why am I being a creep you ask? Because, this world we live in is sickening. It’s so sick that neither men nor women are safe anymore. I don’t want you to grow up here in Sri Lanka. But do I want you to grow up in another country? I really don’t know. Either way, I don’t want you to be a part of this ridiculous petty competition that is currently prevailing. By not being a part of it, I don’t want you to really be cornered or bullied. It’s bad enough that I as your Mother come with the anxiety and depression, let’s try to at least keep that away from you. God forbid there isn’t something else they’ve discovered by then. I know you will grow up in a safe and liberal environment. If you tell me when you are old enough that your sexual orientation differs to what our “culture” defines as “normal”, my love, you will still be my baby and so will your partner. If you tell your (now) Agnostic Mother that you want to embrace an established (or new) religion, I am fine with that as well. Let’s hope that you don’t incline towards Scientology or Paganism. We might have a few problems there. But in reality, there is only so much that I can do to protect you. Despite being a creep, I would still grant you your independence and I know you wouldn’t exploit it. But I cannot be there always. What would happen when I look away? Or when I am not there anymore? Will those around you protect you and have equally accommodating liberal ideologies? Will they let you be who you are? If you say that you don’t want to study and invest in some crazy start up, would they be supportive? Who would be supportive? Would the minority conservative and fundamentalist society we have now grow to be something larger than it already is? I may have watched too many episodes of The Handmaid’s Tale and that’s what’s probably scaring me, but I had made up my mind before that. I can’t have you in this country, let alone in this world because the world is not a good place. It is not a kind place. While there are people like Ellen who preaches kindness, not everyone really practices it. Not everyone shows the other person the respect they deserve. I love little girls and would be thrilled if you a girl but then it scares me really. Would you as a little girl, grow up to face the same challenges and difficulties I did of sexual, physical and emotional abuse for the very reason that you are a woman? This makes me think that boys have it easier. But not really I guess. Even if I were to raise you to be a man who stands up for good causes, would you be able to successfully make it out there without the support of your peers? Worse, how would you be able to deal with peer pressure and no, I don’t mean the drugs and the alcohol. There’s so much more that I want to tell you and make you understand on why it’s simply a bad idea to have you here. It’s my only hope that you would someday understand. I don’t know if you would ever read this or if you would, but after the storm has passed. Obviously catching up on random WP blogs and social media are not priority, I understand. A few days ago a terrible earthquake shook and tore the beautiful Kathmandu I know. I’ve been there twice and it was love at first site. From the rickety airport that looks similar to our central railway station here in Colombo to (only) the main roads of Kathmandu City that were done up with the same haste and sham as our pavements for the Commonwealth Heads of Government Meeting, we have a lot in common. You, Nepal have also a special place in my heart. Some of my closest friends live there and having lived amongst you people while in university and while on work, I cannot help but be genuinely devastated by the disaster that has engulfed you. I don’t recall myself being as emotional when the tsunami struck in 2004. That may perhaps be a result of the lesson in journalism we were taught: familiarity. Media and individuals consider what is newsworthy, based on a few factors namely proximity and level diplomatic importance. The latter of which would mostly be important for media and state-related news I suppose. The proximity of newsworthy-ness refers more often than not, to the geographical proximity of things. This is why, news of Modi or the Great Wall of China collapsing would be important to us. This also very strategically ties up with diplomatic importance, in this instance funding. But Nepal? Last I checked, Nepal was as significant as the recent climatic disasters in Chile. Of course, some may argue that I am concerned by these topics due to my line of work, but it is not always the case. I have a few online friends in South America and some of my closest friends in Nepal. This becomes proximity to me and hence, the news I follow may seem different from what is shown on television. Nepal, I hope you are safe and please keep your people safe. They mean a lot to me and trust me, these people are trying. They are trying to remove themselves from the political and diplomatic clutches while at the same time trying to become self-sufficient and they try to maintain political stability. It’s not easy. Coming from Sri Lanka, I know it is not. But please keep trying and do rebuild your City and bring to life the political willpower and positivity you as a people have in yourself. The news tells me that your Government is doing a splendid job and I hope the news does not lie. I don’t pray, Nepal, I’m sorry. But in my hearts of hearts, when I silently wish for things, I wish for your safety and your health. I want to come back to Kathmandu as much as I want to go back to South India or even come home after a long day’s work. Keep your city safe and your people happy. Apologies on phrase in parentheses. I couldn’t help myself. This post was driven by this, something a friend had shared on Twitter this afternoon. I have nothing against what Philip has to say. In fact, a few of the guys I know are actually hopeless romantics so much so to the extent that ‘chick flicks’ are no longer accurate. I was never a romantic. I had seen and been apart of too many broken relationships, abusive relationships and unhappy endings since my younger days that didn’t provide me the capacity to be pro-relationships. I began dating only after I left school and then left abroad for college a year later. To this date I’m glad I was in college, away from home, because I wouldn’t know how I would be in a relationship had I lived in the same country as my ex boyfriends did. As a result of not believing in the success of relationships, I was glad for the distance. Since childhood, I was looked upon as the opposite of my sister. Friendly and talkative in social situations, yet quiet at home and often ‘kept to myself’. This, I carried with me to the rest of my childhood, teenage years and even to date. I do not open up. I do not express feelings. I care for people who are close to me, it comes naturally but that does not mean I cannot be indifferent to your existence as well. I am a happy loner. Nature and HBO tells me that the wolf pack survives better together but I survive better alone. I do present myself when required, I do not complain about what’s on the dinner table because more often than not, life is mere existence and the reason why we survive, continues to baffle me. I’m not too sure if you would be able to accept me for who I am, but once we do meet I hope you do. I will not cheat on you as that is something I could never bring myself to do, but you must understand that space is priority for me. It’s a concept the previous generation struggles to understand. It’s a concept they understand as physical space, which is not entirely true. I would explain it to you in detail when we meet, but if you are able to understand me without me having to tell you this, I’m sure you would be what hopeless romantics call ‘The One’. I know this is an overly personal letter to you, especially because we are yet to meet, but if you stumble upon this someday, I hope you would be able to read me better. While I do think that communication is important to a relationship, I also think that the ability to understand each other without having to communicate becomes more important. I might be seeking a mind reader and if you are by some stroke of luck, welcome aboard. Romantic relationships were never a priority for me as I know that they are bound to fail due to some shortcoming from my end. I’m not trying the method of portraying myself innocent, but it’s bound to happen. If in the event I don’t meet you or perhaps may remain indifferent to your existence, I truly apologise. I constantly keep myself occupied, as it is one of the most successful and lucrative ways to keep me distracted. I’m a happy loner and if we never meet, I wish you well and all the happiness and sunshine in the world and if we do, I hope the sun would always shine on us.